Review by AllTheBestFights.com: 2015-03-07, fight not particularly exciting between Dominic Boesel and Timy Shala: it gets two stars. Both undefeated, the German Dominic Boesel entered this fight with a perfect boxing record of 17-0-0 (6 knockouts) and he is ranked as the No.53 light heavyweight in the world while his opponent, Timy Shala, has an official record of 19-0-1 (8 knockouts) and he entered as the No.55 in the same weight class. 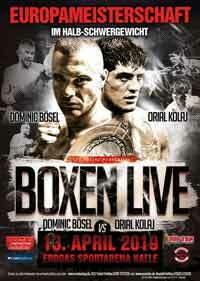 Boesel vs Shala is valid for the WBO Inter-Continental light heavyweight title; they also faced each other a second time on April 13, 2019 (Dominic Boesel vs Timy Shala 2). Watch the video and rate this fight!